Did you know that the sponge you use to clean the dishes, pots and glasses and other kitchen utensils needs cleaning too? 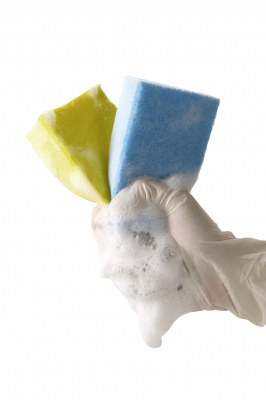 The lowly sponge, if left uncleaned, can harbor disease-causing bacteria. Beside squeezing the oil, dirt and soap off the sponge and place it under running water, sponge can also be sterilized by placing it inside the microwave for two minutes. According to the radio program from where I got this cleaning tip, the heat from the microwave will kill the bacteria in a jiffy. This entry was posted in Cleaning tips and tagged how to clean a sponge, sterilize sponge via microwave on July 11, 2014 by Yami. Excellent tips, i know that sponges can easily breed bacteria.